How many people have used the movies at BrainPOP? How many people have used the quiz that follows the movie? How many of you are using BrainPOP for science and social studies? And how many of you have differentiated instruction using BrainPOP? I just wrapped up facilitating a BrainPOP study group. Our focus was on meeting the needs of diverse learners. If you haven’t taken a good look at BrainPOP lately, run right now and do so! The school district I am in has a subscription that gives us access to BrainPOP, BrainPOP, Jr. and BrainPOP ELL. After being in this study group, we fully are aware of all the good stuff that we have been missing in BrainPOP and BrainPOP, Jr. (we did not explore ELL)… and definitely are taking advantage from this point. First, get a My BrainPOP account. If your school has a subscription, there’s a code for you to use. We have connected our G-Suite with BrainPOP, so teachers easily can create classes in My BrainPOP. What does that mean? When a student goes to BrainPOP or BrainPOP, Jr., s/he can log in, receive assignments and submit them directly to the teacher. These assignments can be: watching movies, taking quizzes, creating concept maps (Make-a-Map), composing their own movies (Make-a-Movie)… and this is only the beginning… NewsELA, Primary Source, Activity, Graphic Organizer, Vocabulary, or Related Reading also are BrainPOP features… and if you are using BrainPOP, Jr., students can be assigned Word Play, Draw About It, Activity, Write About It, or Talk About It. Quizzes can be redesigned and modified by teachers. Templates for concept maps can be shared with supports as needed. Actually, different versions of assignments can be made and shared with specific members of the class. I haven’t even mentioned SnapThought yet or the game features like Sortify that really get students thinking and digging deep as well as reflect on their learning. SnapThought is a real game changer. I always am promoting student reflection, and I was totally unaware that BrainPOP had that feature available! The fact that students are playing a learning game is motivating for many, but I always question whether students are even understanding why they are playing. Sometimes they seem to be ignoring informational pop-ups and just clicking away with no real purpose or thought. I can see how having students stop and take a photo with SnapThought of where they are and explaining their thinking or rationale at that point of the game will keep them focused. I can see having students identify what they have learned at that point of the game being very valuable and reinforcing to skills and concepts they are acquiring. The bottom line: there is great depth to BrainPOP and BrainPOP, Jr. with so many possibilities beyond simply watching movies whole class. With so many avenues to take and customizations to make in this service, there truly is a way to engage all learners. I also see the service as a wonderful formative assessment, giving teachers real time data to inform their instruction in small groups. If you have access to this tool, I definitely recommend you start exploring! I’d love hear any of your favorite things about BrainPOP. Disclaimer: I am not a BrainPOP Certified Educator (although I work with two!) nor am I receiving anything from BrainPOP. I just like spreading good stuff. I came across the Google for Education YouTube Channel today. Tutorials from Google’s “First Day of…” initiative in the Teacher Center. Right now, they have videos for Forms and Classroom. I’m hoping they will continue to add more as they are super easy to follow. Personally, I like watching how-to’s, especially current ones that reflect changes in the services. I also prefer to go right to the source to learn about these updates. What if all of these options were from one source, and were easy to set up and break down throughout the day without toggling between different websites and apps? One thing that also may be of interest, but is not highlighted in the video, is the site’s ExitPoll. ClassroomScreen – is it something you would use? Leave your comments below. Students ask their teachers these two questions quite a bit in the classroom. If a problem truly is being solved, there very may well be multiple methods, viewpoints and solutions to be considered. There doesn’t have to be only one right answer, and for many students that concept is a difficult thing to understand and even accept. Being able to explain and justify one’s thinking can be more important than the one solution that a student believes a teacher seeks. Not to mention, innovation and creativity springing forth, and the influence on other’s approaches and thoughts about a problem. Essentially, students are given a math puzzle with four numbers or objects in a four-square with the task of explaining which one doesn’t belong. This thinking is captured as writing/labels and/or a recording in Seesaw (or Explain Everything could be used as well) and submitted to the teacher. These puzzles really encourage and foster 3 out of the 4C’s: Communication, Creativity and Critical Thinking. Have students watch and comment on each other’s submissions, and then collaborate on yet another solution – well, there’s an opportunity for the missing C: Collaboration. Check out her Seesaw activities, specifically the Which One Doesn’t Belong ones, that you can edit and use with your own students. Brem’s activity was inspired by this website where you can get even more ideas for the puzzles. These puzzles could serve as formative assessments for current topics as well as a great way to review concepts while applying to new learning. Possibly, a different puzzle could be offered each month as students rotate stations. The possibilities could be endless, and that’s exactly what we want to teach our students. The scene: Students have been issued a device off a cart, but they are very busy prepping physical props for their work that they are about to digitize. Materials are everywhere. Floor space is at a premium with students hustling and bustling to gather and refine their plans. Sometimes you are in spaces where there are no tables, desks or high places to put a device if you need your hands for something else. Placing the iPad on the floor even for a second could be dangerous with the the amount of activity and movement going on in the room. 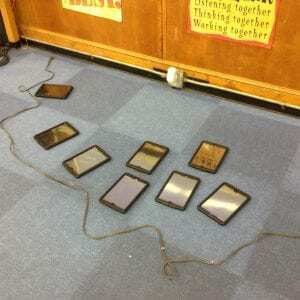 Hmmm… so where do the iPads go? The solution: In a make-shift parking lot. 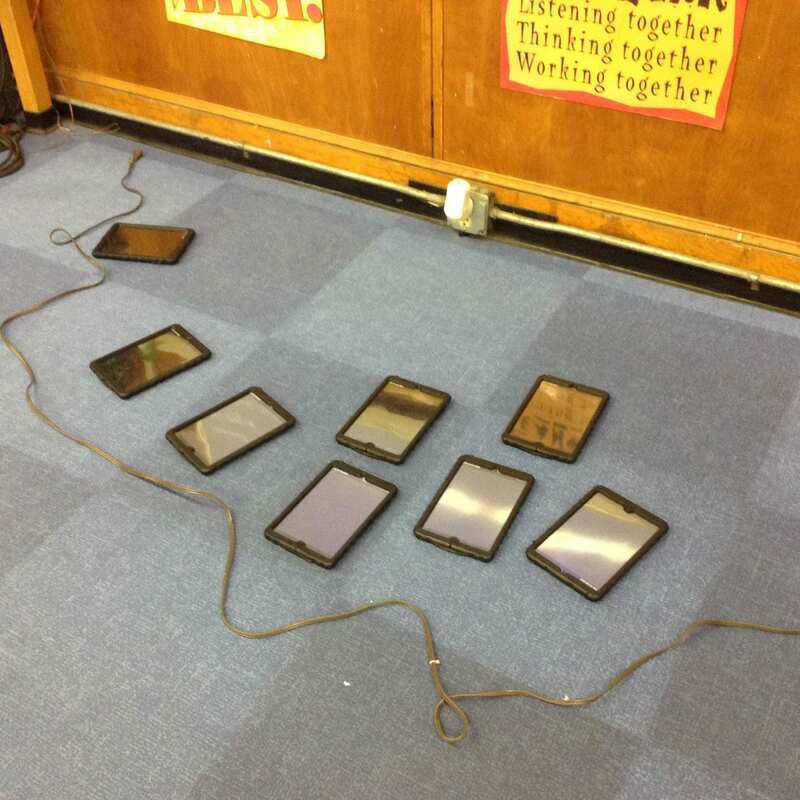 Create a boundary (in our case today, an extension cord not plugged in against a wall in the music room), and have students place devices into the space whenever they feel that they need assistance with their responsibility of keeping their issued device safe. It’s amazing how many students take advantage of using a parking lot on and off during a work session. Plus, sometimes getting the device out of the way helps with focus on the prepping and planning that needs to happen. It’s great for the students to be regulating that on their own as well. Maybe, you can try out a parking lot the next time you are in a non-traditional space? It’s those little things… I think I’ve written in a post or two… that may make a difference.